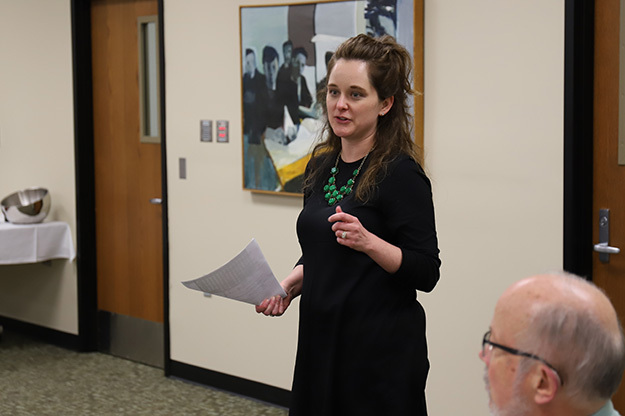 Tera Buckley, UND assistant marketing director, joined other representatives from Marketing & Creative Services and Admissions in leading group discussions about what makes UND’s programs stand out. The chairs will use these conversations to help craft selling points for their departments – key to the University’s recruitment strategy. Photo by Connor Murphy/UND Today. College degree seekers have a tough decision to make. What school, of the thousands across the globe, rises above the rest? What program best fits my unique needs? What experience will set me apart in the workforce? The University of North Dakota knows the answers – and it’s bringing its marketing team and academic leaders together to communicate why UND should top every prospective student’s list. This regular monthly assembly of department chairs carried a recruitment twist, as members of UND Marketing & Creative Services and Admissions sat among the ranks. Differentiation will be key in how UND leverages its partnership with BarkleyREI, who is assisting with a robust digital advertising campaign – part of a $3 million investment in marketing designated in Goal 3 of the One UND Strategic Plan. “We need to be very sharp at defining what we do and how we do it and how we communicate it to the world,” he said. There are several rules to follow when determining key selling points for a program, Kennedy explained. The first is straightforward – don’t use a three-digit number as a sellable ranking (e.g. 278th best in the U.S.). One also has to choose selling “cost” or “quality” – it’s difficult to market both. 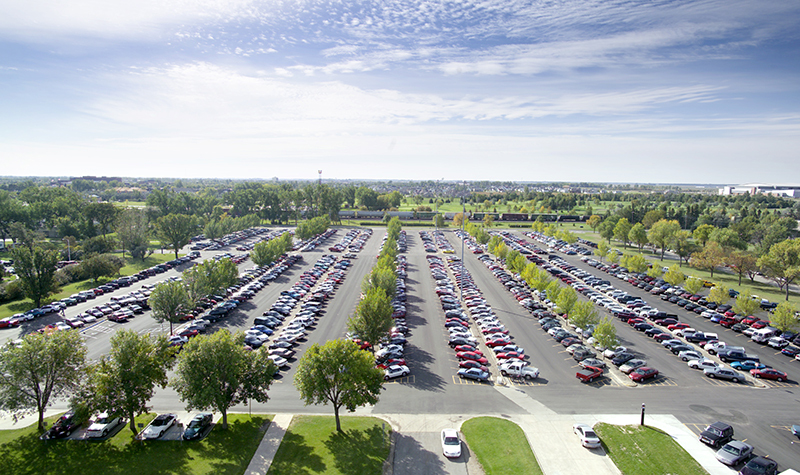 According to Kennedy, “You can be Wal-mart, or you can be Louis Vuitton,” and to maintain message consistency across programs, UND should lean into its vision of being the Premier Flagship University of the Northern Plains. “Premier equals quality,” he said. It’s critical, Kennedy continued, to remember that the public and academia are oftentimes disconnected and tend to speak in different ways. He said it’s less about what UND offers and more about how it communicates what UND offers – in language that students care about. 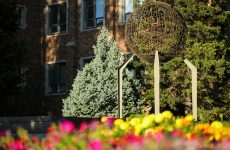 Students are drawn to programs and classes that spark their specific interests and career goals, Kennedy said, and UND has an opportunity to provide those more niche experiences. He added that we’re living in an “experience economy,” and that students want choices beyond fulfilling endless core program requirements. 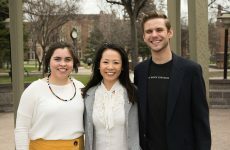 “If you ask [a student] who their favorite professor was, it’s typically in an elective that specifically aligned to their interest,” Kennedy said, explaining that UND must showcase its high-impact programs that deliver stimulating lectures, diverse group discussion, and opportunities for interest-based research and studies abroad. “I truly believe that if we embrace these ideas, it will mean good things for each of your programs and each of your departments,” he said in closing. 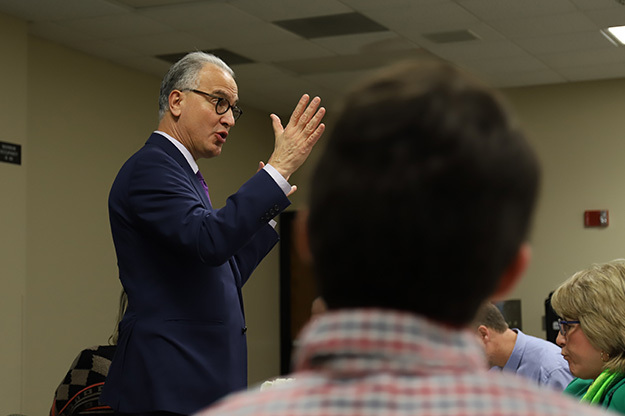 UND President Mark Kennedy shared his marketing expertise with the Chairs Leadership Institute, laying out several rules of differentiation that are essential to escaping “the sea of sameness.” Photo by Connor Murphy/UND Today. Following the presidential pep talk, the chairs held roundtable brainstorming sessions guided by a marketing or admissions representative. Discussions encompassed the importance of using data for verifiable proof points, identifying distinctive student interests, and what’s important to today’s 16-year-olds and graduate program prospects. UND Provost Tom DiLorenzo said this Chairs Leadership session was among the most motivating he’s experienced. “It was a perfect combination of a consultant’s expertise providing context, the President’s extensive background providing direction, and Marketing’s ability to create a compelling message,” he said. The chairs will bring these ideas back to their departments to fine-tune their selling points, and the marketing team will use those selling points for digital ad campaigns, more enticing website information and better follow-up communications.